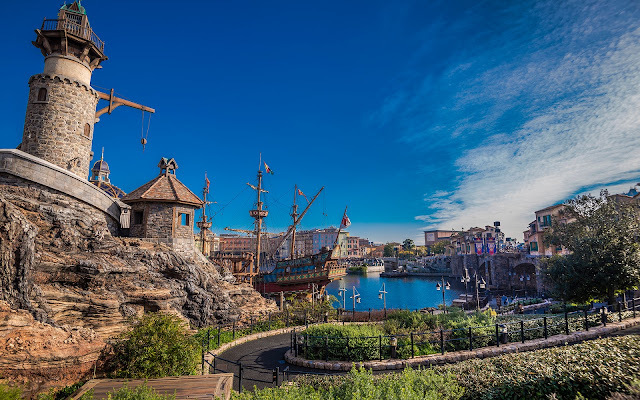 Tokyo Disney Sea really is an amazing visual marvel. I've said before that one can blindly point a camera anywhere at any angle and come up with a great photo, but there are also plenty of designed perspectives and frames and layers in a scene. Take this shot next to Fortress Explorations, on the Mysterious Island side of Mediterranean Harbor. A winding path leads one's eyes down to the water in a scene that is framed by the tower on the left, and a second time with the Renaissance ship docked at port. Beyond that lies the colorful, Portofino style facade of the entry side of Mediterranean Harbor plus the industrial, urban forms of American Waterfront. So many layers in the scene, all unfolding before one's eyes. It's no wonder this Sea of Dreams is a hyper-realistic fantasy come to life! A majestic scene and a stunning day at Tokyo Disney Sea's Fortress Explorations.